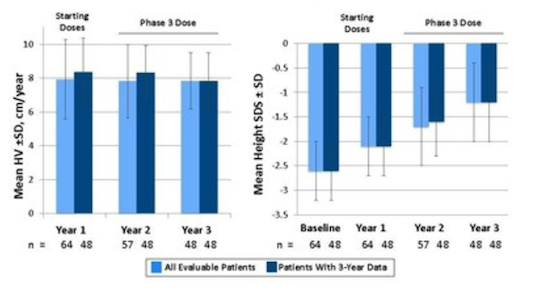 Osilodrostat, a drug that normalized cortisol in 89% of patients with Cushing’s syndrome who took it during a phase II study, continued to exert a sustained benefit during a 31-month extension phase. In an intent-to-treat analysis, all of the 16 patients who entered the LINC-2 extension study responded well to the medication, with no lapse in cortisol control, Rosario Pivonello, MD, said at the annual meeting of the Endocrine Society. Osilodrostat, made by Novartis, is an oral inhibitor of 11 beta–hydroxylase. The enzyme catalyzes the last step of cortisol synthesis in the adrenal cortex. The drug was granted orphan status in 2014 by the European Medicines Agency. In the LINC-2 study, 19 patients took osilodrostat at an initial dose of either 4 mg/day or 10 mg/day, if baseline urinary-free cortisol exceeded three times the upper normal limit. The dose was escalated every 2 weeks to up to 60 mg/day, until cortisol levels were at or below the upper limit of normal. In this study, the main efficacy endpoint was normalization of cortisol, or at least a 50% decrease from baseline at weeks 10 and 22. Overall response was 89%. Osilodrostat treatment reduced urinary-free cortisol in all patients, and 79% had normal cortisol levels at week 22. The most common adverse events were asthenia, adrenal insufficiency, diarrhea, fatigue, headache, nausea, and acne. New or worsening hirsutism and/or acne were reported among four female patients, all of whom had increased testosterone levels. The LINC-2 extension study enrolled 16 patients from the phase II cohort, all of whom had responded to the medication. They were allowed to continue on their existing effective dose through the 31-month period. 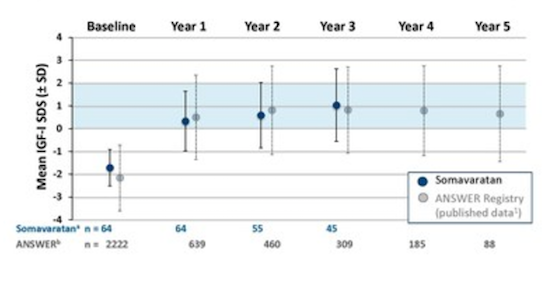 Dr. Pivonello presented response curves that tracked cortisol levels from treatment initiation in the LINC-2 study. The median baseline cortisol level was about 1,500 nmol per 24 hours. By the fourth week of treatment, this had normalized in all of the patients who entered the extension phase. The response curve showed continued, stable cortisol suppression throughout the entire 31-month period. Four patients dropped out during the course of the study. Dr. Pivonello didn’t discuss the reasons for these dropouts. He did break down the results by response, imputing the missing data from these four patients. In this analysis, the majority (87.5%) were fully controlled, with urinary-free cortisol in the normal range. The remainder were partially controlled, experiencing at least a 50% decrease in cortisol from their baseline levels. These responses were stable, with no patient experiencing loss of control over the follow-up period. The 12 remaining patients are still taking the medication, and they experienced other clinical improvements as well. Systolic blood pressure decreased by a mean of 2.2% (from 130 mm Hg to 127 mm Hg). Diastolic blood pressure also improved, by 6% (from 85 mm Hg to 80 mm Hg). Fasting plasma glucose dropped from a mean of 89 mg/dL to 82 mg/dL. Weight decreased from a mean of 84 kg to 74 kg, with a corresponding decrease in body mass index, from 29.6 kg/m2 to 26.2 kg/m2. Serum aldosterone decreased along with cortisol, dropping from a mean of 168 pmol/L to just 19 pmol/L. Adrenocorticotropic hormone increased, as did 11-deoxycortisol, 11-deoxycorticosterone, and testosterone. Pituitary tumor size was measured in six patients. It increased in three and decreased in three. Dr. Pivonello didn’t discuss why this might have occurred. The most common adverse events were asthenia, adrenal insufficiency, diarrhea, fatigue, headache, nausea, and acne. These moderated over time in both number and severity. However, there were eight serious adverse events among three patients, including prolonged Q-T interval on electrocardiogram, food poisoning, gastroenteritis, headache, noncardiac chest pain, symptoms related to pituitary tumor (two patients), and uncontrolled Cushing’s syndrome. Two patients experienced hypokalemia. Six experienced mild events related to hypocortisolism. Novartis is pursuing the drug with two placebo-controlled phase III studies (LINC-3 and LINC-4), Dr. Pivonello said. An additional phase II study is being conducted in Japan. Dr. Pivonello has received consulting fees and honoraria from Novartis, which sponsored the study. Prednisolone treatment of patients with adrenal insufficiency is associated with significantly elevated total-and low-density-lipoprotein (LDL) cholesterol levels compared with use of an alternative glucocorticoid, hydrocortisone, new data suggest. Real-world data from the European Adrenal Insufficiency Registry (EU-AIR) were presented on April 2 here at ENDO 2017: The Endocrine Society Annual Meeting by Robert D Murray, MBBS, consultant endocrinologist and honorary associate professor at Leeds Teaching Hospitals NHS Trust, United Kingdom. Indeed, the new findings support recent recommendations from the Endocrine Society to use hydrocortisone as first-line glucocorticoid replacement therapy for primary adrenal insufficiency. But the huge cost difference between the two generic medications has led some to suggest otherwise. In 2014, the BMJ published editorials arguing both for and against the preferred use of prednisolone. During his presentation, Dr Murray reported that in the United Kingdom, an annual supply of 5-mg prednisolone (one tablet a day) costs about £16 and 3 mg (three 1-mg tablets a day) about £48, compared with £1910 for a year’s supply of twice-daily 10-mg hydrocortisone. Dr Murray pointed out that about 75% of the patients in the database were taking 5 mg/day of prednisolone and that although that’s within the recommended range (3–5 mg/day), it might be too much. “I suspect this isn’t related to the steroid use, but that we may actually have gotten the doses wrong, and we may need a smaller dose of prednisolone. I think probably in reality the ideal dose is probably nearer to 3.5 to 4 mg. Therefore, I think we may be slightly overtreating these people and both the bone mass and the cholesterol may be a reflection of that. “I think for now we have to stay with hydrocortisone as our mainstay of treating adrenal insufficiency, but I think more studies need to be done in patients taking 3.5 to 4.0 mg to then look at the effects on cholesterol, bone mass, and other markers….It would be quite a significant saving if we were able to move patients to prednisolone,” he added. Beginning his presentation, Dr Murray noted that data on risk factors for cardiovascular disease in patients with adrenal insufficiency treated with prednisolone are scarce, despite this condition being the predominant cause of excess mortality, and so in this analysis he and his colleagues aimed to address this gap in the literature. EU-AIR is a prospective, observational study, initiated in August 2012 to monitor the long-term safety of glucocorticoids in patients with adrenal insufficiency, and of 946 enrolled — in Germany, the Netherlands, Sweden, and the United Kingdom — 91.8% were using hydrocortisone for glucocorticoid replacement therapy compared to just 6.8% using prednisone, with marked heterogeneity in doses and frequency and timing of dosing (Endocrine Abstracts. 2015: DOI:10.1530/endoabs.37.EP39). Other previous studies have found lower bone mass at the hip and spine with prednisolone compared with hydrocortisone-treated patients, but no quality-of-life difference between the two treatments, Dr Murray said. The current study is the first patient-matched analysis of cardiovascular-risk-factor differences for the two glucocorticoid therapies. Patients were excluded if they were receiving more than one glucocorticoid, had congenital adrenal hyperplasia, were receiving modified-release hydrocortisone, or were receiving prednisolone or hydrocortisone doses outside the Endocrine Society’s recommended ranges. Prior to matching, the 909 hydrocortisone patients were significantly more likely to be female, to have primary adrenal insufficiency, to be older, and to have longer disease duration. After matching three hydrocortisone patients for every one taking prednisolone, the 141 hydrocortisone and 47 prednisolone patients were similar for those factors: 62% were female, 40% had primary adrenal insufficiency, average age was around 59 years, and disease duration 23 years. Both total cholesterol and LDL levels were significantly higher, at 6.3 and 3.9 mmol/L, respectively, in the prednisolone group compared with 5.4 and 3.2 mmol/L for hydrocortisone (both P < .05). However, there were no significant differences in rates of hypertension, diabetes (of either type), blood pressure, triglycerides, or HDL cholesterol. In subgroup analysis, both total and LDL cholesterol were elevated among patients with primary adrenal insufficiency taking prednisolone, but among those with only secondary adrenal insufficiency, just total cholesterol was elevated with prednisolone. Dr Murray said it’s certainly plausible that the current prednisolone dosing is too high for two reasons: First, in the United Kingdom prednisolone comes in 1-mg and 5-mg tablets, so taking 5 mg/day is simpler than taking the lower end of the recommended range. Dr Murray is a speaker and consultant to Shire. Disclosures for the coauthors are listed in the abstract. Dr Stratakis has no relevant financial relationships.